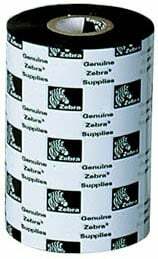 The Zebra 2000 Standard Wax is a standard thermal transfer wax ink formulation for printing high-quality, durable barcodes on Zebra's coated paper label stock. This wax ribbon can print at speeds up to 12 ips. The Zebra 02000BK17445 is also known as ZEB-02000BK17445-C	.